Let’s be honest: successful game development is not about developing a game. Is about being able to find an audience for your game. A mistake that many independent developers are doing is to push all their resources into the actual making, leaving little to no budget for networking and marketing. Being able to build hype around your game is, in most cases, essential. You shouldn’t expect people to love what your games just because you do. 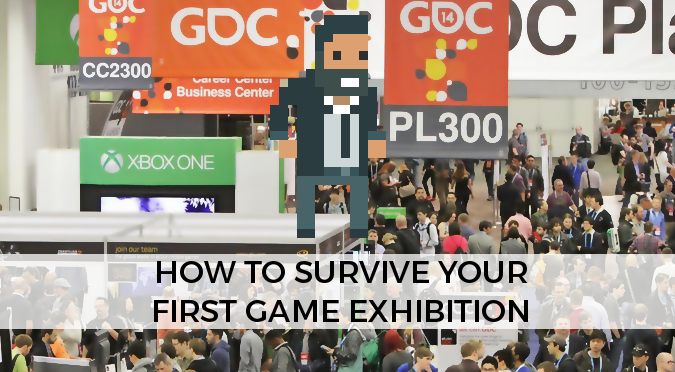 In the past few months I’ve received several messages from young developers asking me for advice on how to approach their first game exhibition. Whether you’re going to be an exhibitor or an attendee, that’s the post for you. The first important question when there’s a new event is whether you’ll be attending it or now. Events are cool, and the first idea is to attend as many as you can. Every event you attend has the potential to expand your audience and your network. However, the more events you do the less benefits you’ll have from attending another one. When the majority of people know you, the cost of the event can overweight its benefits. The first step to understand which events are important (for you) and which really aren’t, is planning. Find the events. Start by finding the events near you; services such as PromoterApp and Gameconfs are just exactly what you need. Remember that different events have difference audiences: is it oriented to gamers, developer or both? Plan the time. Unless game development is your full time job, you might not have the time to attend all of them. Check which one you are compatible with your daily job. Just remember that attending a game event is a job, not a holiday. If you’re taking days off, you might need few more to recover. Have a budget. Events cost. Be sure to know how much you can spend without risking too much of your finance. If you actively take part to the event (presenting a game, doing a panel, …) you might have a couple of free tickets. Set your objective. Be honest about the objective of every event you’ll be attending. Is it for networking? Is it to meet potential publisher? Is it to meet journalists? Is it to showcase your game? Are you part of a panel talk? What’s the purpose of attending the event? Define what success means for you. One of the most controversial aspects of exhibiting a game is whether you’ll pay or not for your booth. Many events, such as Rezzed and EGX have both options (namely, the Leftfield Collection and the Virgin Media Game Space). Other spaces for indies, such as the Indie Mega Booth can cost at least $1500 per kiosk. If your game is not out yet, that money might not be recouped at all. Even if your game is out, the spike of just showcasing your game at a game event might not be anything special. After all there are other dozens (if not hundreds) of games showcased and is unlikely players will go home and buy yours, even if they liked it. The majority of events require a ticket to enter. Events directly oriented to players are usually quite cheap. Others, such as GDC and Develop are not. When this is the case, events have an indie ticket which should be fine. Even if you can’t attend all the talks or see all the part of the expo, you can still do networking. Even if you don’t have a ticket you can sometimes enjoy most of the event: Mild Rampus and Games by the Sea overlaps big events and are free to attend. 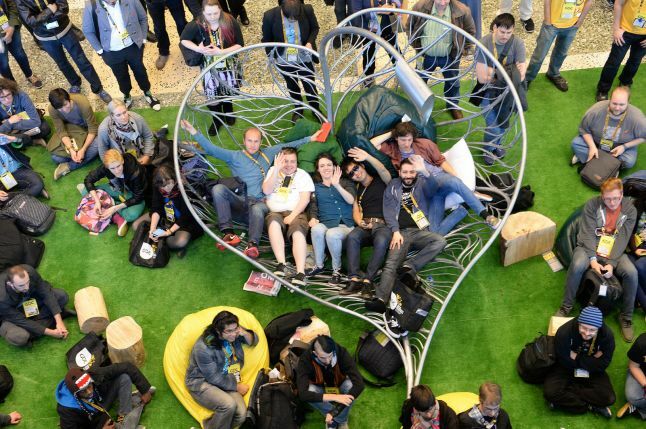 You’d be surprised by how many people hang out in the ground floor of the Moscone Center during GDC, without having at ticket. Travel is usually an annoyance. But if you plan your journey cleverly, you can use that time in an interesting way. The Train Jam is a game jam which happens on the train from Chicago to San Francisco and is attended by many developers travelling to GDC. It’s one of the best way to break the ice and meet other passionate developers. Last year the event was featured on the documentary Rise of the Indies. Even without going that extreme, you can still meet interesting people if you plan your journey carefully. Accommodation-wise, the best option is to share something with other developers. I’ve been in “indie houses” before, and despite the banter can sometimes be exhausting, they’re a good way to save money and make friends our of colleagues. If you know for sure you’re attending GDC, you better rush and book a room at the infamous Indie Hostel. Making the most of a game exhibition is very hard. If you’re exhibiting you’ll most likely be standing and talking non-stop for days. Even worse, people will ask you the same questions. OVER AND OVER AGAIN. And you have to keep the same passion every time you explain your game. Find a good elevator pitch so that you can explain what your game is about, or what you’re doing exactly, in no more than thirty seconds. I’m sorry to burst the bubble for you but “I’m working on an indie game” is not a pick-up line any more. Every developer there is making a game, and every players has played dozens of games. What makes your special (besides you making it!). «I’m working on a an indie game» is not a pick-up line any more. Talk with the press. The success of a game event is often measure by the amount of coverage your game receives. Journalists are overloaded with inputs during expos, and they have to quickly trim what’s hot from what’s not. Be sure to get in touch with as many as you can, so that they know you exist and how to reach you. If you have some interview planned, just remember that they’ll never be on time. NEVER. Talk with the developers. If you’re not showcasing anything, you have the perfect chance to talk with as many developers as you can. Building a network is essential in every job, especially in game development where the revenue comes from other people buying your games. Being a developer you can relate to other developers: use this to engage with them in a way they’ll remember you. Find something unique so that they will remember YOU among these five hundreds other players. Talk with the gamers. Game events are the best chance to get feedback from your players. If you’re presenting, keep them engaged and be sure to get their contact if they’re interested. Just don’t spam them. If you’re not presenting, you can still make great use of the event by running around the event with a demo of your game and finding people who are interested in playing. Sometimes crashing at game events with your own build can be veeery productive. If you’re a game developer, attending an exhibition is a real job, no matter if you’re presenting your game or not. Exhibition can be very expensive, both money and time-wise. Take both these aspects into consideration. Try to get the most out of it by expanding your network as much as you can. Be someone people will remember and engage with them shorty after the event. And lastly, remember that learning which events not to attend is harder than attending all of them. Practice Theory Play: 10 questions to consider when exhibiting games and designing games for exhibitions.